The earliest accounts indicate that the clan established itself in Northumberland, England in the early 11th century. John Palmer has recorded lineage previous to that date in his manuscript written in 1836 but the Norse surname became a landmark in the 13th Century. By the 1500's they were established in Normandy and the name had been anglicised and the families Christianised. A great Hall and estates were built under the supervision of the first Richard Whitfield in Normandy in the 1200s. Two Richards, a Robert, a Matthew and a John succeeded him. The subsequent heirs married in property to daughters of high standing and property worth and the estates were linked with significant Castles and estates in Northumberland, Durham and Cumberland. In the year A.D. 1557, two brothers, Thomas and William moved from Normandy into England. William settled in Northumberland with other family relatives and Thomas settled in Surrey at Mortlake, otherwise known as Wimbleton Castle, six and a quarter miles southeast of London Bridge. At this time, the name had been anglicised and was pronounced "Whitfield". In the year 1606, Thomas Whitfield of Mortlake, Surrey was granted a coat of arms - the stags head - with the motto "In Medio Tutissimus Ibis" which in translation means " A middle course in all things" or " Thou wilt go safe in the middle road.". 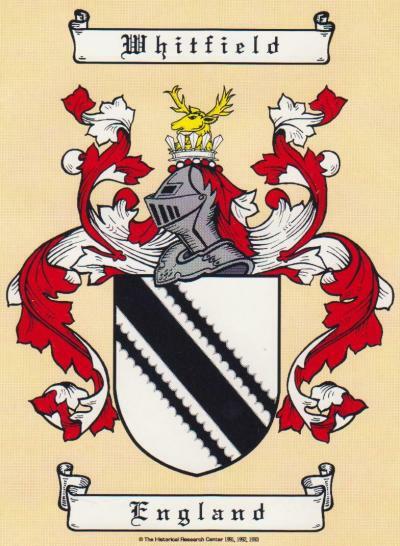 The coat of arms in the book of Heraldry is sometimes spoken of as belonging to WHITFIELD and at other times as belonging to the House of Surrey which would indicate that the Whitfields were known as the Surreys or House of Surrey. Thomas Whitfield was known at that time as Lord of Surrey, which probably meant that he was Sheriff of the County of Surrey or some office of that kind. It could also mean that he was Lord (Overseer) of the Surrey Land Holdings. ARMS:..Argent (silver), a bend plain between two cotises engrailed Sable (black). CREST:..Out of a pallisado crown Argent (silver), a buck's head Or (gold). NOTE:..Descended from John Whitfield of Tenterden, living 1548, second son of Robert Whitfield of Wadhurst, co. Essex. A silver shield with transverse cotises in black on either side of a white band. On the crest of the shield there is a silver palisade crown from which rises a gold stag's head. John became, in early life, a leading comedian actor in the Royal Drury Lane Theatre, and the Theatre Royal, Covent Garden. where he attracted the attention of the Prince Regent (afterward George IV.) who became his patron. He was a first cousin of George Whitfield, the celebrated evangelist. John’s father and mother were both well known in the theatre at that time. Robert, his father was a theatrical manager and tailor (costume designer) and wardrobe keeper while his mother (Catharine Carter) was a dresser for the plays. Robert was attached to the Covent Garden theatre from 1759 until 1791. He also appeared on the Royal Drury Lane playbills for 2 April 1788 in School of Scandal; 25 April 1788 in Twelfth Night; 10 March 1795 in Merchant of Venice; 29 Sept.1795 in MacBeth; and 20-23 April 1796 in Almeda, Queen of Granada. In his first marriage to an actress and singer, Mary Lane, John had born five³ children. Not much is known about his first wife and their marriage; however the eldest of the sons is believed to have been the Lord Forester of the Royal Windsor Estates. Mary died in 1795. John then married Maria Ann Healy in the late 1790's, a lady of some family means, who was descended from ancient English aristocracy having come from an old English family of high social standing and of some considerable wealth. This was John's second marriage and it ended in divorce a while later. John Whitfield and Maria Ann Healy had two sons. Thomas Chapman Healy Whitfield was born in London, England on Jan 6, 1799. His brother Frederick John Whitfield was born 9th of May 1800 in Woolwich (London) Kent County , England. After the divorce, Anna Healy took the two sons to live in Bath where she lived until her death in 1847 or 1848. ³ Some records indicate six children however it is believed he raised 5 after an early death of 1 son. See *** below for additional information. The following document was found in a series of letters and papers passed down through the family. It is interesting in that it gives an insight into the close ties between the House of Surrey and the House of Windsor: Thomas was then living with his mother who was separated from his father. When Thomas was about 14 years old in the year 1813, he went to London to visit his father. His father received him very kindly. One morning he took him over to Windsor Castle to present him to the Prince Regent. They were received in the private reception room of the prince. When the Prince came in , he wore a long dressing gown indicating that he had just come from his sleeping room. He placed his hand on the head of the boy and speaking to the father said "Whitfield, is this the boy that you were speaking to me of?" The father replied in the affirmative, and there followed a long conversation in which the father was urging the Prince to do something for his son. Just what it was the boy did not understand, but he understood that finally the Prince agreed to do it and the father in high spirits took the son and bode the Prince good-bye and went away greatly elated. On their return home the father showed the son all over the house, calling his attention continually to the various things the house contained. Among other things, he showed him a cash-box full of gold coins. After he showed him everything, he said "Now my boy come and live with me and I will make a gentleman out of you." Thomas replied "my Mother will take care of me Sir!" . This so angered the father that he turned away from the boy, and had nothing more to say to him, and soon after the boy went back to his Mother and never saw his father again. Mrs. John Whitfield, Mary, nee Lane (d. 1795), actress, singer, and wife of John Whitfield, known for playing haughty types in comedy. the following records were extracted from St. Martin In The Fields, Westminster, London England. The following children were born to John and Mary Whitfield. Today, there have been 11 visitors (40 hits) on this page!